Here’s the second of our new Lisette patterns for spring 2016. 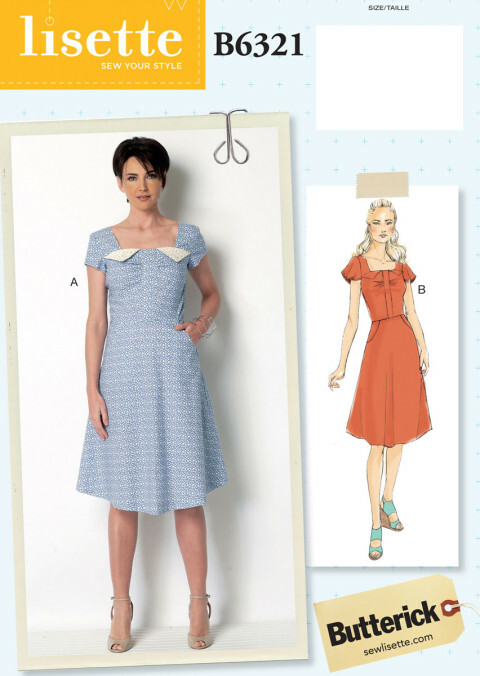 This one is Lisette for Butterick B6321. I thought it would be nice to offer a fresh, springtime dress. This design has a little vintage flavor to it. I think of it as a sundress, and you can choose to sew either a basic short sleeve or a tulip sleeve depending on the look you want. But the essential features are what makes it special. This style includes a center-front panel with a pretty ruching detail instead of a dart. It also includes a little faux collar that I think could be fun to try with a fancy doily or a little embroidery. The flared skirt has pockets, and the dress closes with a side zipper. I think of it as a very feminine style that should get you through the whole summer. It could go to the beach, the museum, church, concerts, even a night out. Do the shoulders and bodice remind you of the Oliver + S Garden Party Dress? That’s what I was thinking of when I drew it. I think you could do a mother-daughter look using the two patterns; it wouldn’t be too matchy-matchy but would have just enough similarity to be really cute together. You could also try a little color blocking, either through the center-front panel or bodice vs. skirt, for other fun looks. In terms of fabrics, obviously a pretty floral is a great direction for this style. A small, delicate floral will give the dress a vintage flavor like we did for the pattern cover, but a big bold floral would also be fresh and fun. Look for a sateen or a lawn for a perfect summer print. Linen would also be beautiful, of course. Try chambray or eyelet for a crisp summer look. (I think chambray would be perfect for this style.) Or if you want a more drapey fabric, go with silk or rayon. This would be really pretty and could dress up the style for a special event like a summer wedding. Another styling suggestion: wear it with a narrow belt for a really great look. However you make it, I hope you’ll show us! Add it to the Lisette Flickr group, tag it #sewlisette and #B6321 on Instagram, and show us how you styled this pattern to make it your own.